Lenovo offers visitors immersive experiences with four different experiential zones dedicated to AI & HPC, IOT and Telco NFV, Data Analytics and The Cloud. Dubai, United Arab Emirates – October 15, 2018 – Lenovo Data Center Group (DCG), a global technology leader in driving Intelligent Transformation today announced its participation in the 38th edition of GITEX Technology Week 2018 at Dubai World Trade Centre. Lenovo DCG’s third participation in the region’s premier technology event comes with a larger presence this year with a showcase of its strengths in high-performance computing and an array of products and solutions that are fit for the ‘Intelligence Revolution’ era. 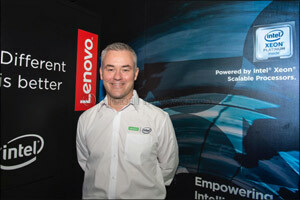 In line with Lenovo’s ongoing ‘Intelligent Transformation’ strategy the company presented a series of new products, partnerships and solutions at GITEX Technology Week which include immersive experiences through their dedicated zones for AI & HPC, IOT and Telco NFV, data analytics and the cloud. These new offerings respond to the appetite for new devices that meet the demands of customers and harness the potential of data, cloud computing and machine learning. “When these new technologies come to life, there is an intricate connection between people and technology and this is something we are calling Intelligent Transformation. We believe GITEX Technology Week is the perfect platform to bring our vision to the centre stage.” He continued. Lenovo’s new ThinkSystem storage solution. For more information visit the Lenovo stand A7-25 in Hall 7, Dubai World Trade Centre.